Dr. Hetts is currently a fourth-year Resident in Diagnostic Radiology at the University of California, San Francisco (UCSF), CA. He received his AB from Harvard College and MD from Harvard Medical School, Boston, MA. 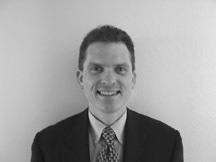 He completed an Internship in Internal Medicine at Stanford University Hospital, Stanford, CA. He plans to remain at UCSF for a Fellowship in Diagnostic and Interventional Neuroradiology following completion of his residency. Interventional magnetic resonance imaging (iMRI) encompasses diagnostic and therapeutic procedures that use magnetic resonance (MR), in whole or part, for the guidance of, assistance in, or immediate assessment of therapy. 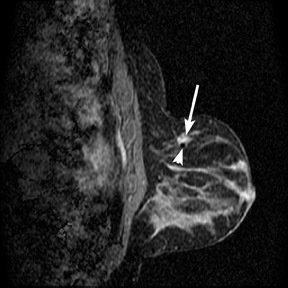 The advent of fast imaging techniques, allowing real-time MR fluoroscopy, and innovations in both MR and X-ray equipment design, have permitted the application of MR guidance to a variety of clinical and research situations. Widespread adoption of MR guidance, however, will depend in large part on overcoming both technical and financial challenges. 1 This article will provide an overview of the burgeoning field of iMRI and offer a glimpse of its future potential. Several disadvantages of iMRI must be noted. Exposure to loud sound during real-time imaging sequences such as fast gradient-recalled echo (GRE) and fast spoiled GRE (up to 99 decibels, the equivalent of a New York City subway train) necessitates use of earplugs for patients and ear-covering headphones for the operating team. 7,8 In addition, the biologic effects of repeated exposure to strong, rapidly shifting magnetic fields are not fully understood, are not yet routinely quantitated, and, hence, remain a challenge for personnel monitoring. Limited access to the patient can be a problem, depending on the geometry of the interventional magnet. A relative dearth of MRI-compatible devices, ranging from patient vital-sign monitoring equipment to surgical tools, adds to procedural cost, as does the increased time often needed to perform procedures under MR guidance. As a nascent technique, iMRI is currently in a transitional phase. Few interventions are performed solely under MR guidance; instead, many also involve steps guided by X-ray fluoroscopy. Thus, there has been impetus in recent years to develop systems that combine clinical MR scanners with clinical X-ray fluoros-copy or C-arm systems. 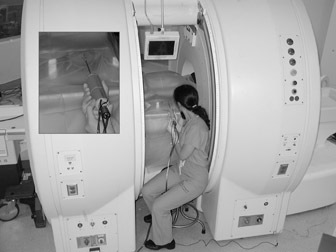 Two approaches have been taken (Figure 1): 1) placing a short-bore 1.5T MR scanner in line with an X-ray angiography suite, with the patient transferable in minutes between the 2 units via a sliding table 9 ; and 2) fitting a specially designed X-ray tube in the gap between magnets of a "double-donut" open 0.5T MR scanner. 10 Both systems have merits: the former produces better quality (shorter acquisition time, higher resolution) X-ray and MR (1.5T) images, and the latter allows nearly simultaneous X-ray and MR acquisitions without cumbersome patient movement during procedures. 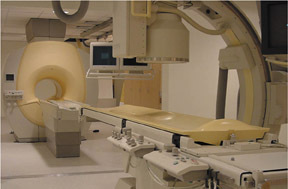 Interventions, such as brain tumor resection, in which MR imaging is required only intermittently and no X-ray data are necessary, can be achieved simply by removing the patient from a standard clinical MR scanner stationed immediately adjacent to an operating theater and returning the patient intermittently when new MR data are needed. 1,11 For example, intermittent MR can be used to evaluate the margins of resection not just versus a preacquired 3D stereotactic data set, but also against a newly acquired data set that delineates intraprocedural "brain sag" and intraprocedural complications, such as hemorrhage or infarct. Devices used in the MR suite must be MR-safe, MR-compatible, and visible to the interventionalist. To be safe, a device must use little or no ferromagnetic material, as the missile effect of the strong magnetic field of clinical magnets is well known and hazardous. Electrical cables can also pose a danger through induced heating by the magnetic gradients and radiofrequency (RF) pulses used in imaging 12 ; thus, the development of wireless forms of interventional devices is currently under investigation. 13 Devices also need to be MR-compatible, not creating undue imaging artifacts, yet still visible during the intervention. Visibility can be achieved through active or passive means. 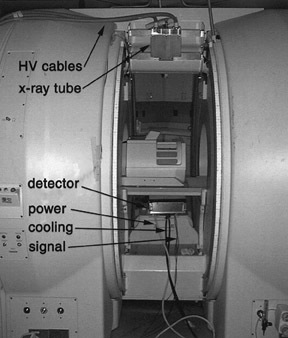 Passive methods rely on the MRI artifact created by paramagnetic materials, such as gadolinium or dysprosium, which can be used to coat all or part of the device. Placing one or more small RF antennas on the interventional tool (eg, catheter, guidewire, needle) creates very high MR signal around the device, greatly enhancing conspicuity. Active devices, however, may be somewhat limited by local heating, especially when used in small blood vessels or solid tissues, where flowing blood does not dissipate heat as efficiently as it does in large vessels. Interventional MR is being applied both to procedures that are already clinically routine-biopsies, tumor ablations, angioplasty, and stent-ing-and to novel procedures made possible by this new guidance modality. Another novel approach to MR-guided tumor ablation is the use of magnetic targeted chemotherapy administered via transcatheter embolization. 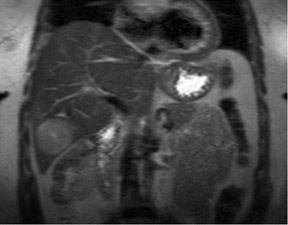 In a phase I/II clinical trial involving 4 patients with inoperable hepatocellular carcinoma, doxorubicin linked to metallic iron-activated carbon (MTC-DOX, FeRx, San Diego, CA) was administered endovascularly to the hepatic artery branch(es) supplying the tumor under X-ray fluoroscopic guidance. 27 A 5-kilogauss portable external magnet (Magnet Sales, Culver City, CA) was positioned over the liver in the approximate location of the tumor during MTC-DOX injection to attract the chemotherapeutic agent. 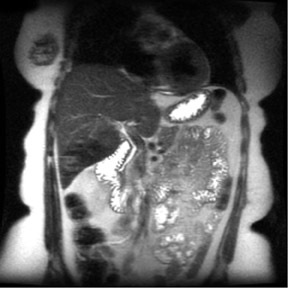 MRI performed before and after MTC-DOX administration showed preferential deposition of chemotherapy within the tumor as opposed to normal adjacent liver tissue (Figure 4). Increased accuracy of chemotherapy delivery may allow not only dose reduction and concomitant reduction in toxicity, but also a reduced number of chemotherapy sessions. 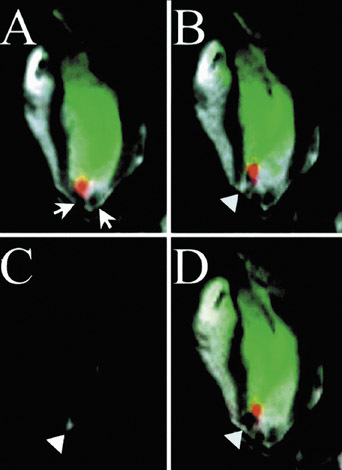 Pulsed sonication with focused ultrasound at lower power than is used for thermocoagulation (as low as 0.2W versus 30W to 450W) can be used to open the blood-brain barrier (BBB) transiently without damaging adjacent tissue, thus allowing delivery of drugs or cells to sites in the central nervous system (CNS) that are normally sequestered from the vasculature. 30,31 Transient opening of the BBB is shown on T1-weight-ed MRI by focal enhancement after gadolinium administration, an effect that fades over hours to days and has been correlated histologically with the presence of normally impermeable test molecules in brain parenchyma. The basis for BBB opening is thought to be mechanical stress imparted on vascular walls when FUS is used to cavitate an intravascular preformed gas microbubble ultrasonographic contrast agent (Optison, Mallinkrodt Inc., St. Louis, MO) injected shortly before sonication. Recent work in rabbits has shown transient BBB opening though an intact skull with induced pressures of 0.5 MPa. 32 The normally impermeable large molecule horseradish peroxidase was injected intravascularly and was shown by electron microscopy to pass into the brain parenchyma interstitium adjacent to capillaries, arterioles, and venules by both transendothelial and paraendothelial routes. Given that many novel therapies (drugs, gene constructs, stem cells) for CNS disorders ranging from ischemia to Parkinson's disease are impermeable to the BBB, the use of noninvasive FUS to allow focal delivery of these agents is very exciting. Catheter-based iMRI (CBiMRI) was reviewed in detail in last year's Applied Radiology Residents' Forum. 36 Two areas in which MR shows pathophysiology, and thus can be used for immediate evaluation of treatment efficacy, are aortic coarctation repair and carotid stenting. In a canine study, 37 acute aortic coarctation was created with plastic ligatures placed around the descending thoracic aorta and collateral blood flow around the coarctation (comparing blood flow in the aorta above the coarctation and at the diaphragm) was assessed by retrospectively gated balanced T1 fast field-echo MR. Subsequently, a self-expanding nitinol stent was deployed across the coarctation under MR fluoroscopic guidance (using a balanced fast field-echo sequence), with poststenting flow measurements showing no residual collateral flow, implying complete physiologic reversal of the coarctation. 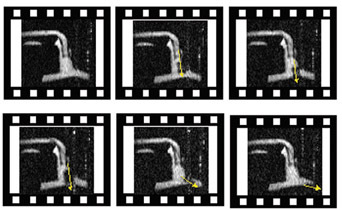 Similarly, no residual high-velocity jet was apparent on velocity-encoded cine MRI. However, evaluation of the aortic lumen in the area of the stent was possible only using X-ray angiography due to MR signal dropout within the nitinol stent, thus emphasizing the utility of XMR facilities until, and unless, MR transparent stents become available. Similar MR angiography signal dropout is evident in human carotid stenting, 38 where evaluation of cerebral perfusion by arterial spin labeling before and after intervention is under way. For more on the evaluation of tissue perfusion using MR, please refer to the review in this issue by Dr. Zaharchuk. 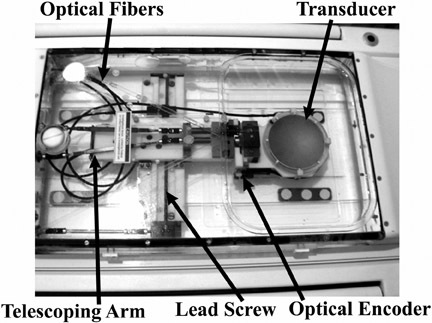 The strong ambient (B 0 ) magnetic field of the MR scanner allows a special opportunity for iMRI not available in other forms of interventional guidance. 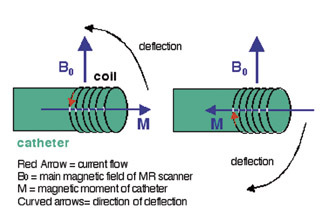 6 As illustrated in Figure 6, if an electrical current is run through a coil mounted on the tip of a catheter, a magnetic moment is generated. This magnetic moment will then interact with the B 0 field, creating a torque, which, in turn, causes deflection of the catheter tip. 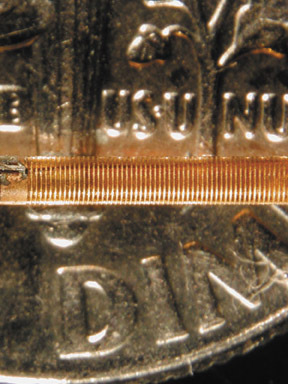 If 3 coils are mounted orthogonally on a catheter tip, then virtually any tip orientation can be achieved through selective activation of each coil. Initial in vitro experiments have shown the ability to navigate simulated vascular bifurcations up to 90°. The combination of technologies like this with advances in robotics 1 and nanotechnology offers the possibility of truly integrated remote-controlled interventions under MRI guidance in vessels too small or tortuous to be reached with current methods. Interventional MRI is beginning to come into its own through applications using old procedures and as the gateway technology to novel, minimally invasive therapies. Although significant hurdles in terms of expense and procedure time will limit the rate of its adoption, iMRI is already reaching clinical utility at academic institutions in the areas of breast biopsy, tumor ablation, and neurosurgical guidance. As a gateway to new forms of intervention, however, MRI promises to become a major player in the not too distant future. The author would like to thank Anthony Bernhardt, PhD, Michael Guttman, MS, Gloria Hwang, MD, Timothy Roberts, PhD, Mark Wilson, MD, and Greg Zaharchuk, MD, PhD for helpful discussions and figure images. Interventional magnetic resonance imaging: The revolution begins. Appl Radiol.